The pyrolysis process is a thermochemical process, and the presence of a catalyst is usually performed at a high temperature. Different types of catalysts, natural and synthetic c, can be used to convert organic waste into valuable fuel. 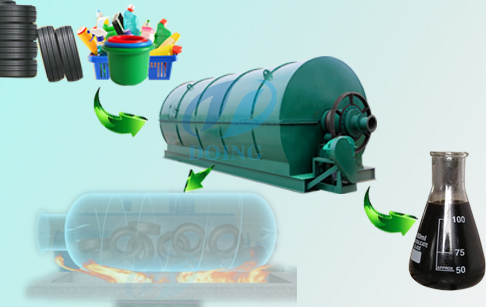 The DoingGroup's waste plastic pyrolysis equipment pyrolysis of waste plastic into liquid fuels based on this heating process. First, waste plastics are fed into the reactor via an automatic pusher. Secondly, the reactor is heated and the waste plastic in the reactor is subjected to thermochemical treatment to crack oil and gas. Once again, the cracked oil and gas will enter the condensing system under the action of high and low pressure. After being cooled, it will be liquefied into liquid fuel and fall into the tank. Finally, the smoke generated during the combustion process is filtered and discharged, and the waste residue is automatically discharged through the measured slag. If you wanna to get more details about Pyrolysis of plastic waste to liquid fuel process you can send E-mail to market@doinggroup.com. You can consult our professional engineer and specialized sales team with leave a message in below form.We will contact with you ASAP.You also can visit our factory in Henan,China.Get Detailed address.